FREE SHIPPING (CONUS* International customers please click here) and personalized signings if you use Paypal! Warren Zevon songs are like chapters in a great American novel. Its story lies in the heart of his and our psyche. The lines are blurred. We never seem to know if we are looking in a mirror or peering through a window; we only know that when we listen we see something. The music sets the scene; his voice a striking baritone, our guide through a labyrinth of harrowing narratives. The plot unfolds without subtlety; each musical and lyrical arc awakens imagination. 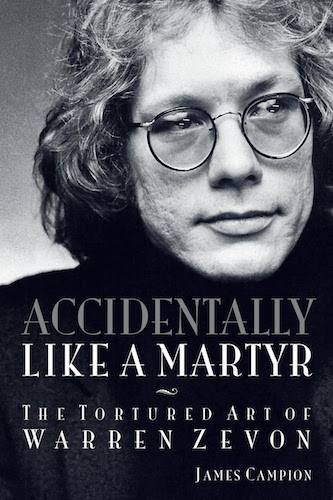 In Accidentally Like a Martyr: The Tortured Art of Warren Zevon, music journalist James Campion presents 12 essays on seminal Zevon songs and albums that provide context to the themes, inspirations, and influences of one of America’s most literate songwriters. In-depth interviews with Zevon’s friends and colleagues provide first-person accounts of how the music was lived, composed, recorded, and performed. Longtime fans of this most uniquely tortured artist, as well as those who want to discover his work for the first time, will get inside the mind, talent, and legacy of the wildly passionate Excitable Boy. Book signings and music appearances, click here!